Infliximab (Remicade ®, Janssen) is an IgG1k chimeric human-murine monoclonal antibody that specifically binds with high affinity to TNFα, and is indicated for active adult and pediatric Crohn’s disease (CD), adult and pediatric ulcerative colitis (UC), rheumatoid arthritis (RA), ankylosing spondylitis (AS), plaque psoriasis (Ps), and psoriasic arthritis (PsA). Initial approval from FDA was granted in 1998 for active CD and fistulizing CD. The following year EMEA approved infliximab for the same indications under ‘exceptional circumstances’, while FDA extended authorization to active RA in association with MTX on the basis of an additional multicenter study. Initial approval from Health Canada was given in 2001 for RA and CD. FDA extended approval in 2002 for maintaining clinical remission in CD, in 2004 for AS, in 2005 for PsA and UC, in 2006 for pediatric CD and Ps, and in 2011 for pediatric UC. 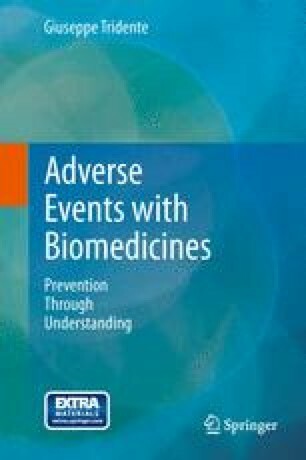 Meanwhile, alerts were issued by FDA on fungal infections (2008), and on increased risk of lymphoma and other cancers associated with the use of TNF blockers (including infliximab) in children and adolescents (2009). The online version of this article (doi: 10.1007/978-88-470-5313-7_24) contains supplementary material, which is available to authorized users.